Ahhh, the Color Run. If you've found yourself here, you're likely either preparing yourself for a Color Run (or similar color infused fun race) or you're desperately seeking advice on fixing your hair post-Color Run. Either way, we've got you covered. The Color Run is the "Happiest 5k on Earth." It may be great running 3.1 miles and getting yourself splattered with fun poofs of magical color, but the fun is all over when your hair won't let go of bright pink and blue streaks that slowly fade into a salmon color from the depths of Hades. That's not going to be pretty at the office on Monday morning. It's all fun and games until your $200+ in a salon bill and wishing you would have taken some steps to prevent your hair from staining in the first place. What Is All That Color Anyway? 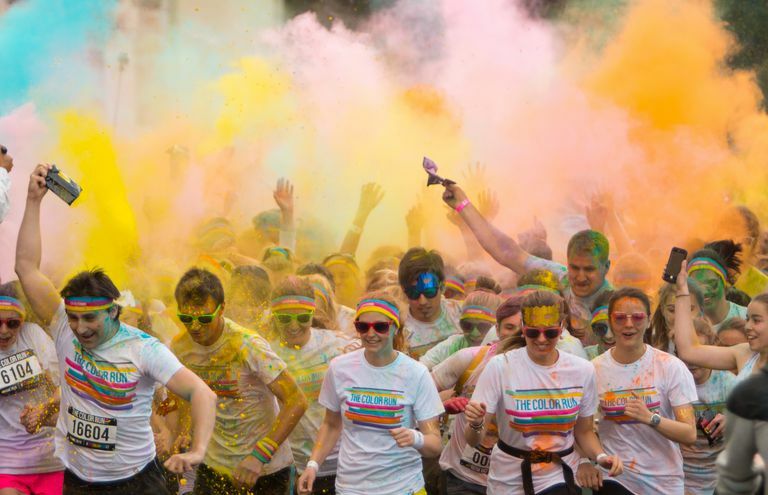 The "color" in the color run is mostly corn starch colored with food grade dyes in bright colors like blue, pink, orange, green, and yellow. Color is basically thrown on you as you run through the 5K course. You start off dressed in all white, you end up looking like a rainbow. Super fun, right? Can You Prevent the Color From Staining Your Hair? The short answer is yes, mostly. Like we mentioned, everyone's having a great time until their hair is stained and you're elbows deep in your hair stylist's chair praying that you won't have to show up to work looking like you spent the weekend at a clown convention. Some hair stains easier than others. The lighter and more processed your hair is, the more likely it is to stain. So, if you color your hair blond, you'll want to pay the most attention. Fine hair tends to stain easier than coarse hair. If your hair is porous, dry, or otherwise any color lighter than dark brown, the chances that your hair will stain is greater. A couple of deep conditioning treatments before your race will also lessen the chances of staining after. To completely prevent your hair from staining, pull your hair back tight and wear a hat or a bandana that covers your hair completely. A wig could also be fun for a color run. If you're not as concerned or are willing to throw a little caution to the wind, you can apply a heavy moisturizer or oil to your hair before your run. Wet your hair and liberally apply a heavy conditioner, olive oil, or coconut oil to your hair. Some people get by with applying a leave-in conditioner as well. The more concerned you are with your hair staining, or if your hair is very light or highlighted, the heavier your oil/moisturizer. Brush it through to make sure it's evenly distributed. Yes, your hair will look greasy. A ponytail or a bun will help mask the greasiness. After the race, rinse your hair very very well in cool water until the water runs clear, and then shampoo your hair well. Allow the shampoo to sit on your hair for a few minutes before rinsing. Hopefully, the oil will have created a barrier between your hair and the dye, plus you'll have a nice moisturizing treatment, and super soft hair after the race. If you find yourself with stained hair after the Color Run, don't panic. There are some things you can do to help get that color out. If the staining is significant or you can't live with it (and you've already tried the options above), there are a few heavier hitters that can help strip that dye out of your hair. We scoured the internet for other ideas and came up with some interesting tactics for removing color run dye. Soaking your head in ketchup was a popular choice, and seemed to help several people. We're not exactly sure why ketchup was helpful. Other people found mayonnaise helpful as well. Again, not really sure why that worked other than it's heavy in oil, so perhaps that was the key. Other people tried using Ajax, Tide (or other laundry detergents), and even bleach to get the unwanted dye out of their hair. If you get to the point that you're ready to put Ajax, Tide, or bleach in your hair, call your hairstylist for help. You could really cause a lot more harm than good, certainly a lot of dryness ,and possibly breakage to your hair. Regardless of how you get the Color Run dye out of your hair, a good deep conditioning treatment afterward will help your hair feel as good as new.